When experience, knowledge, and quality are what you are looking for in a custom automation systems, look no further than Ward Systems. From stand-alone cells to completely integrated product lines that include all automation, fixturing, and material handling. We produce high quality, safe, and reliable systems. We also offer technical support and warranties for all of our products. 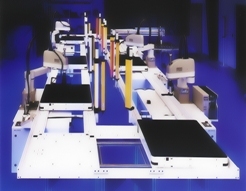 To learn more about our custom automation systems, contact Ward Systems. Stand-alone Automation Cells to completely integrated production lines with all automation, fixturing and material handling.